Jp. = Dainichi Nyorai, Ch. = Dàrì Rúlái. 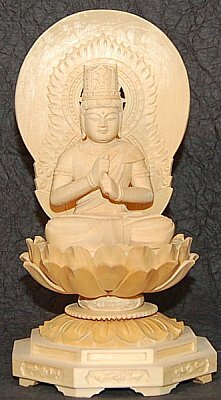 Large wooden statue depicting Dainichi Buddha sitting atop an ornate lotus. 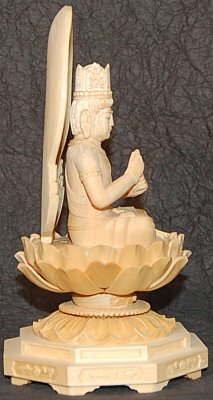 Dainichi is the central deity of Japan's Shingon Sect of Esoteric Buddhism, and the main object of veneration in Vajrayana (Tantric) Buddhism in Asia. 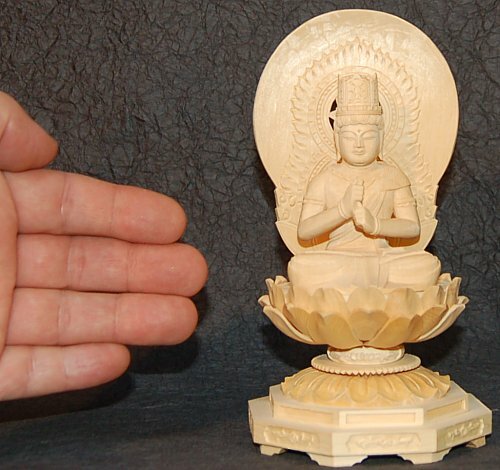 In Japan, images of Dainichi appear most often in the Taizokai (Womb World) & Kongokai (Diamond World) mandalas, which together depict the key devotional images of Esoteric Buddhism. 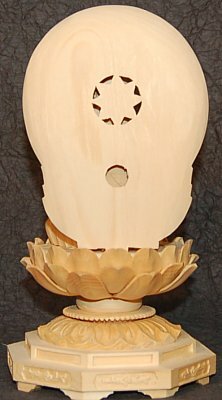 Dainichi represents the unifying cosmic force, the central essence shared by all myriad forms of the phenomenal world. Hand Gesture = Wisdom Mudra (aka Mudra of the Six Elements). See the Dainichi Top Page for more details on iconography. 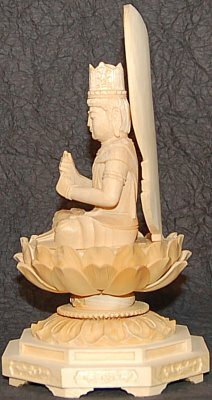 Dainichi also serves as the Zodiac patron of Sheep and Monkey folk.